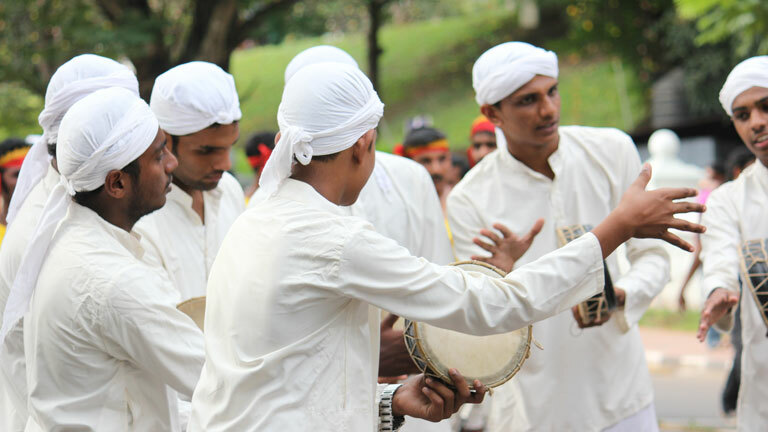 Duffmuttu is a ritual art form prevalent among Muslims in the Malabar region of Kerala. Duff is a percussion instrument made of wood and ox skin. Duffmuttu is performed as a tribute to heroes and martyrs. It is performed as social entertainment and to commemorate festivals. The singers sway their bodies to the tempo of the song which is set by the rhythmic beats of the duff. In the beginning the songs were in Arabic language. Over the years it transformed and songs in other languages are sung today. Dapp Ratheeb is a Duffmuttu religious ritual. Muslims used Dapp Ratheeb in their prayers. This is also known as Kuth Ratheeb. Though in the past Duffmuttu was performed by the male members only, today with some restrictions women are also allowed to perform Duffmuttu.